Lilo and Stitch were both lonely. She was a little girl, bullied for being different. He was a deadly experiment gone loose. Together, Lilo and Stitch taught each other the meaning of being happy in a family. They made sure each other will never get lonely, even if that means battling giant aliens and catching other experiments on the loose. Lilo’s outfit is very laid-back. When she’s not in her hula class, she wears a red hibiscus-patterned dress and slip-ons. Stitch is a furry, blue alien. 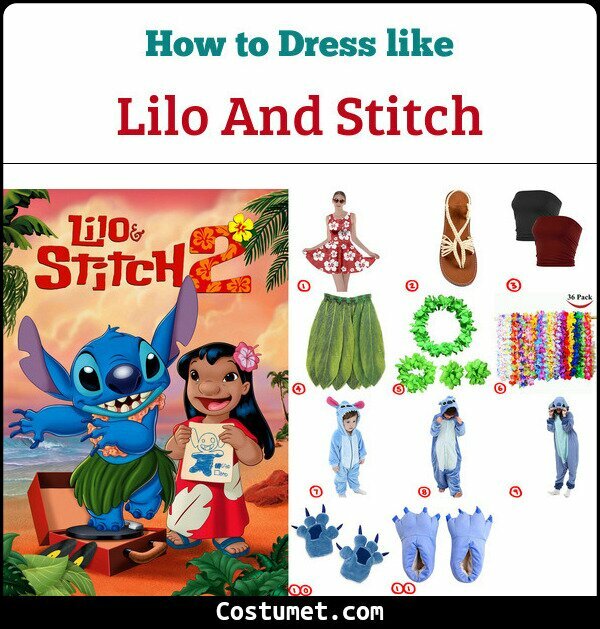 Here’s everything you need to look like Lilo and Stitch. 1 Red Hibiscus-Patterned Dress Lilo looks very Hawaiian in her casual red hibiscus-patterned dress. 2 Flat Summer Sandals Wear a pair of flat summer sandals to feel those awesome beach vibes. 3 Red Bandeau Top Lilo wears a simple red bandeau to hula class. 4 Green Hula Skirt A green leaf skirt makes hula class more fun. 5 Luau Leaf Crown and Bracelets As part of her hula costume, Lilo wears a leaf crown, bracelets, and anklets. 6 Lei Necklace Level up the Hawaiian vibes with a Lei necklace. 1 Stitch Baby Onesie Dress your baby as Stitch is this adorable little onesie. 2 Stitch Kids Onesie Your kids can also dress up as Stitch with this kid-sized onesie. 3 Stitch Adult Onesie That’s everyone in the family if you wear an adult-sized Stitch onesie, too! 4 Stitch Gloves Step up your Stitch game with a pair of these gloves. 5 Stitch Shoes Match the gloves with these awesome Stitch shoes. Lilo is voiced by actress Daveigh Chase. She also played Samara Morgan in The Ring. Stitch is voiced by director Chris Sanders. Aside from directing Lilo and Stitch, Sanders is also one of the writers of Disney classics like The Beauty and the Beast, Mulan, and The Lion King.